[New for 2012] Man was Monday a long long long day. After battling a mean sinus headache for most of the day, my appetite suddenly returned and for whatever reason, I needed Arby's bad, real bad. If I could have left work early to go get some, I would have. 5 o'clock came and off I raced to get my roast beef fix. Now I know I implied that I will never have another fast food shake.... but once I saw the menu, I couldn't resist! It's so darn cute! I want Christmas and I want it now! It's funny because I almost bought some candy canes the other day and now I'm glad I didn't. I'll admit it, I put on a big smile when the server handed me this shake. I even said something like "wow, that's cool looking" (think I caught the server off guard with that one). I don't think this photo does it justice because it's so much cooler looking in person. As you can probably tell, I was oh so excited to have this in my tired hands. Sure, I may be biased because I was starved and looking forward to my icy cold reward, but I really like this shake. I settled in quick and pretty much enjoyed every sip. I can't believe how much it tastes like a liquid candy cane. I'm even surprised at how well this went with my roast beef sandwich and curly fries. I bounced between the three flavors with ease (and enjoyment). I suspect that the very thin nature of Arby's shakes had something to do with the easy transistions as well. Ok, technically I didn't finish my shake. It's 20oz and I did what? 13/14 ounces or so? No worries, gotta stop when you are full. Now the colorful sauce has really started to run, so I decided to grab a spoon and give it a taste. Despite it's bright red coloring, the flavor is actually quiet mild and pleasant. If I was a kid, I would totally spoon this stuff up and finish it off. 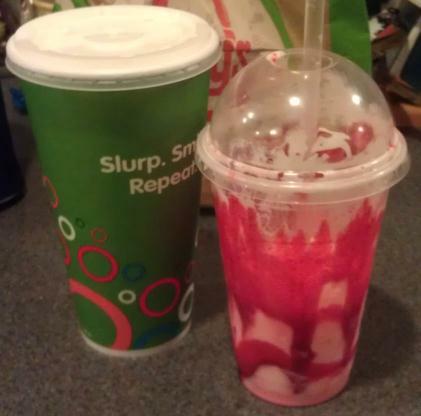 Oh, and that's a 32 ounce vanilla shake to the left of my shake. I thought I would be sneaky and get a "large" shake for my wife and daughter to share, totally expecting a standard 21oz cup.... who knew places still sold 32oz shakes?! (yeah, they didn't finish either). My only regret is not knowing that we could have all tried this free last week, DOH! Nutritional Info: You know it's bad for you, so just don't have one everyday --- but if you want, you can get it without the whip cream and peppermint on top. Official Tagline: "Add some holiday cheer to your meal with our new thick and creamy Peppermint Stick Swirl Shake. 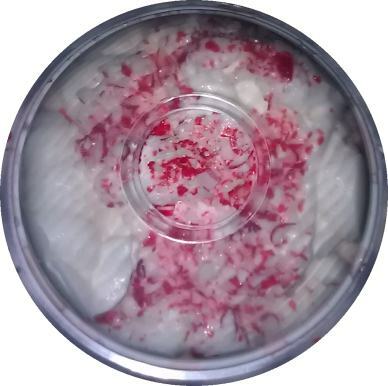 Get into the spirit of the season with our peppermint swirl, topped with whipped cream and chopped peppermint sticks. 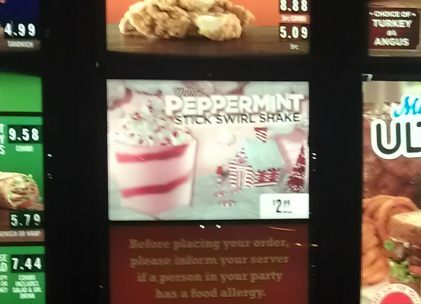 Be sure to drop by Arby’s soon because, like the holidays, the Peppermint Stick Swirl Shake only comes but once a year." I love all the peppermint holiday foods out! Wish I had an Arby's near me to try this. Hope you are feeling better Dubba; sinus headaches are the worst! thanks, it was a nasty one, but at least it passed a lot quicker than it usually does! all the peppermint foods are making me feel extra festive this year, I have no idea why. 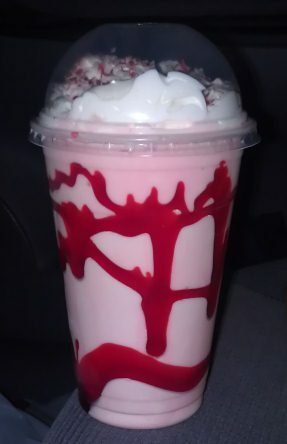 I thought this shake was awesome. The best looking shake I've ever had, and it tasted very nice. Feared it would be too sweet but that wasn't the case at all.